With long days and warm nights, the summer is undeniably a great time to be outside. Everyone wants to be able to soak up the warm sweet sunshine while they can, and the best place to do it is at your own home. However, we don’t all have the perfect patio ready to go. 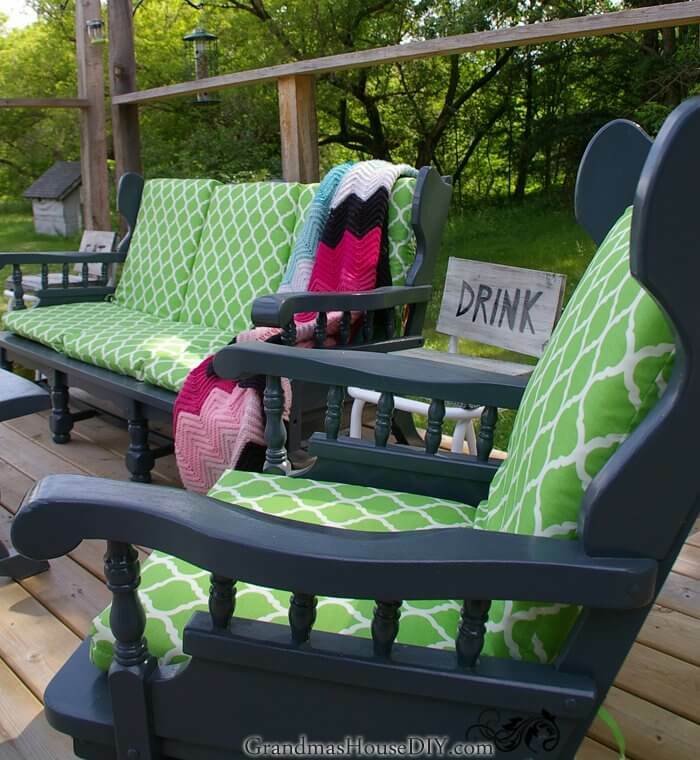 That is why this list of 14 ideas for DIY patio furniture is perfect. 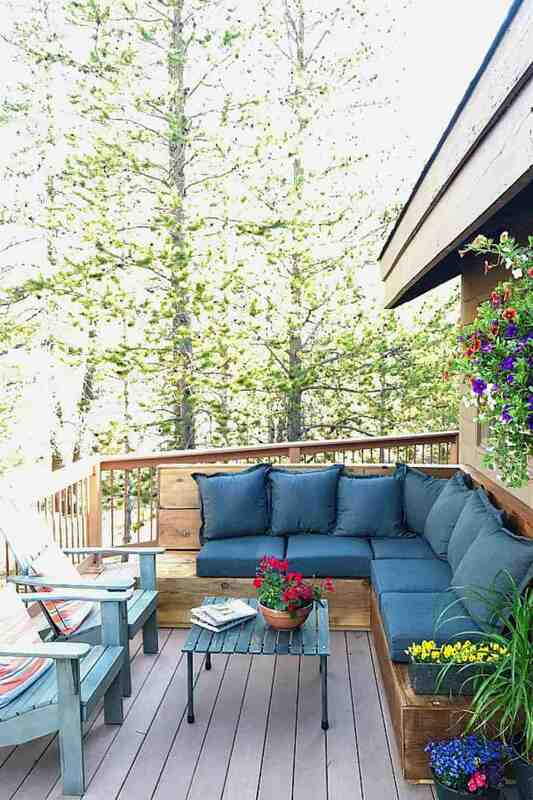 These ideas will get you inspired to get going on that project you’ve been dreaming about all winter and turn your back deck into the patio of your dreams. Don’t get the wrong idea, of course: there is probably some wonderful elements to your patio already. Maybe its location is ideal. Maybe you’ve renovated it over the years. Maybe it has a view of that one special tree. Whatever you love about your patio, use these ideas to enhance those already excellent qualities. Be sure to think about the spacing and colors of each design, and don’t be scared to take a small piece of an idea and run with it. These are all great DIY ideas, but you know your tastes and your space better than anyone. Have fun, be creative, and get outside. This beautiful bench, with its light wood and intricate backing details, is perfect for any patio. You never know when a trickle of rain might threaten your enjoyment of the great outdoors – not to mention your outdoor cushions and pillows. This project is perfect for those days because the bench opens for a quick and convenient storage space. If you are looking to build a bench that is versatile, simple, and sturdy, then this is a first-rate choice. 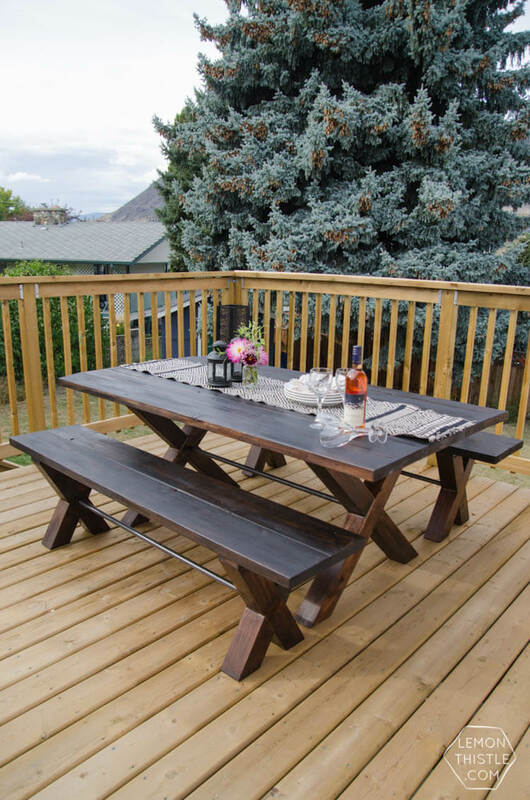 The dark natural wood color fits in with any outdoor setting and makes for easy maintenance. 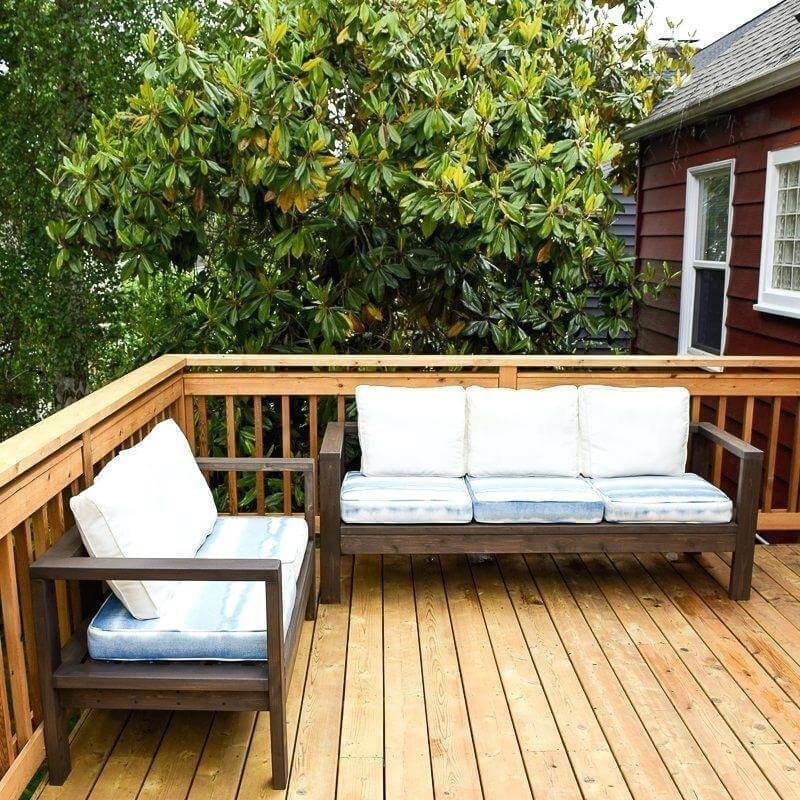 You can, of course, opt for any colored wood you’d like, and don’t forget to add cushions that go with your other patio design elements. An easy solution to warped wooden table tops or water stains is to create a concrete table topper. 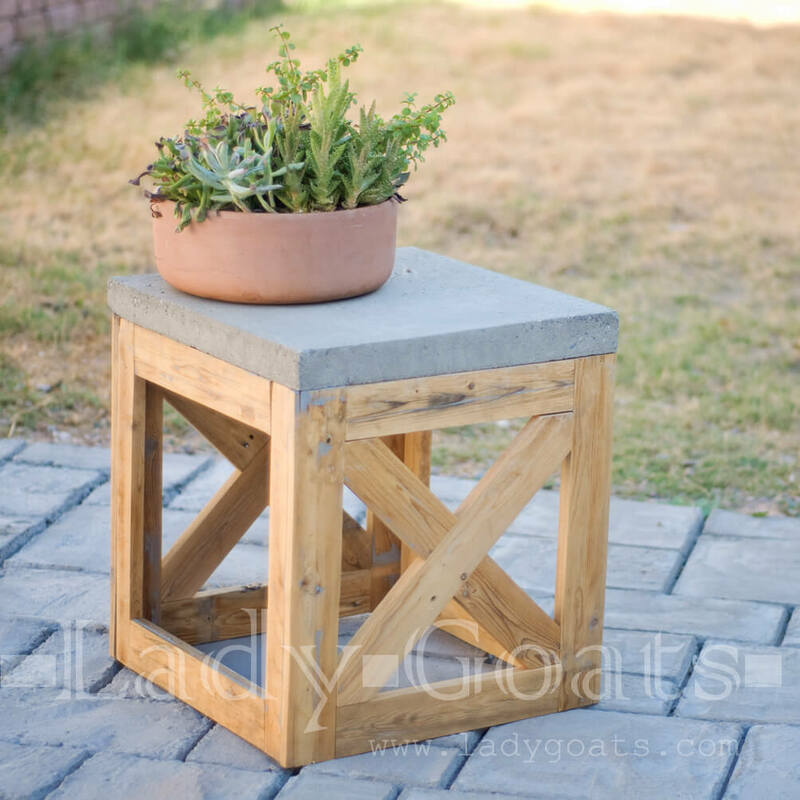 Made from simple concrete pavers and a few pieces of pine, you can make this table in a few short hours and have the perfect outdoor piece. Be sure to use a strong adhesive to keep everything in place. Are you looking for an idea with some artistic flair? Then a gorgeous and bright-colored mandala is a great addition to any DIY patio furniture. This beautiful farmhouse-style bench is easy to create at home. For this design, you can either use a stencil or, for those who are more artistically inclined, you could attempt your pattern freehand. Sometimes it can be easier to find older pieces whose design you love and bring them to life with a little DIY. Chairs like this can be found at local thrift shops, antique stores, and flea markets. The hard part is then seeing beyond the current condition of the chair to the elegant perfection that you can create with it. When you think of lazing on the porch on a sunny afternoon, nothing sounds better than being able to sway in that cool gentle breeze. 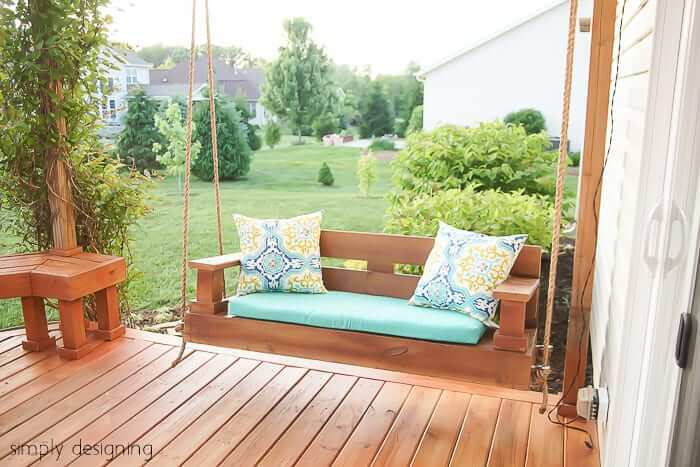 This porch swing is a simple and sturdy option. With just a few hours of work, you will be swinging in no time. Just be sure your patio beams are sturdy enough for a swing. 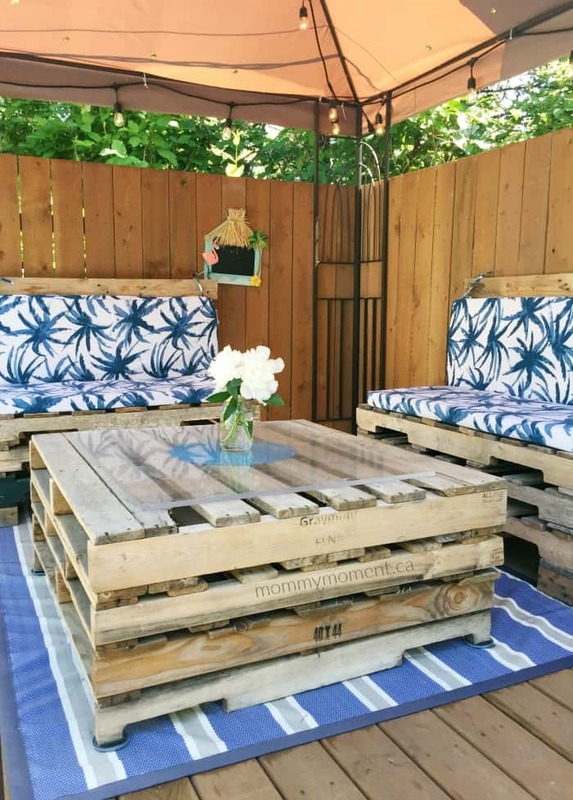 Pallets are a great option for outdoor furniture. Sturdy and inexpensive, they create a rustic yet charming finished look. This set uses totally unfinished pallets mixed with some cushions and a glass table topper for a charming and simple look. Be sure to find decent-looking intact pallets, and feel free to paint them or leave them bare. 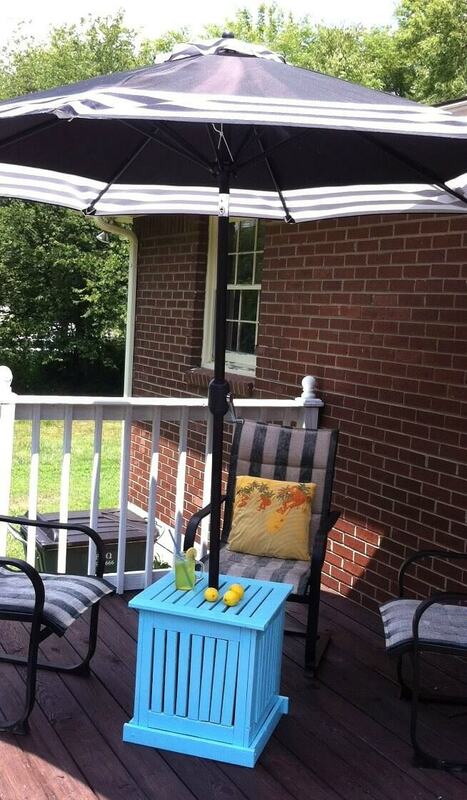 Perhaps you have a good umbrella to keep you cool and dry on your patio, but how sturdy is it? To safeguard against wind while also adding some color and a small center table, create your own umbrella stand to save majorly on cost. The pictured product is turquoise, but finish with any color to complement your patio aesthetic. This cleanly designed piece can serve as a small table, foot stool, or even additional seating. The designer behind this idea has only included instructions for the wood frame, leaving the decision for the square top up to you. 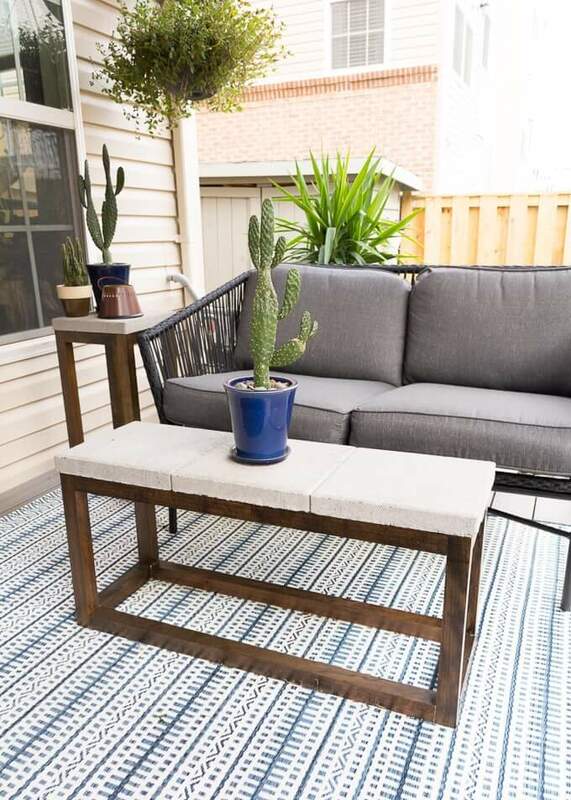 If you plan to place plants or decoration, repurpose a dark wood or a concrete slab (as pictured), or add a cushion if you envision guests taking it as a seat. DIY and luxury do not always go hand in hand. 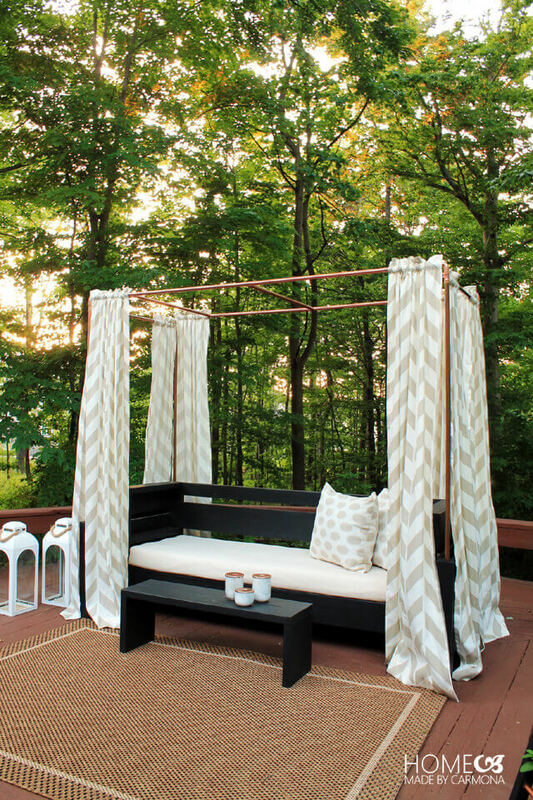 While the appeal of DIY is often its rustic or elemental composition, this backyard cabana has relaxation written all over it. It may take some work to assemble the copper pipes and drape the curtains, but then you will feel as if you were transported to the Bahamas. If the word “hosting” brings to mind having more than just a friend or two over, then this outdoor sectional might be the ticket to transforming your patio into a top-tier hangout. While this design is a bit more expensive than some DIY projects due to the cedar planks, the final look is cozy, solid, and party-ready. With easy-to-follow construction plans, this bench will practically make itself. 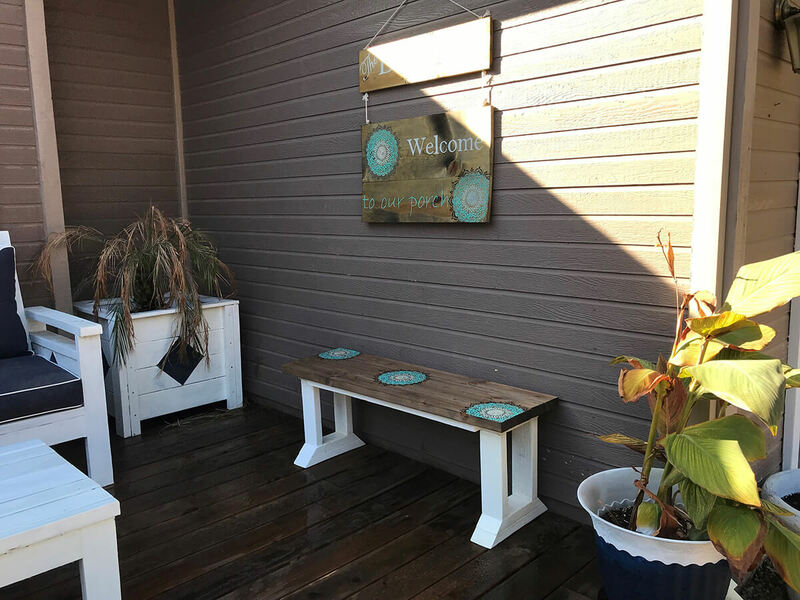 Well, that may be an exaggeration, but still, with some boards, paint, and persistence, you could create your own charming bench in a matter of hours. 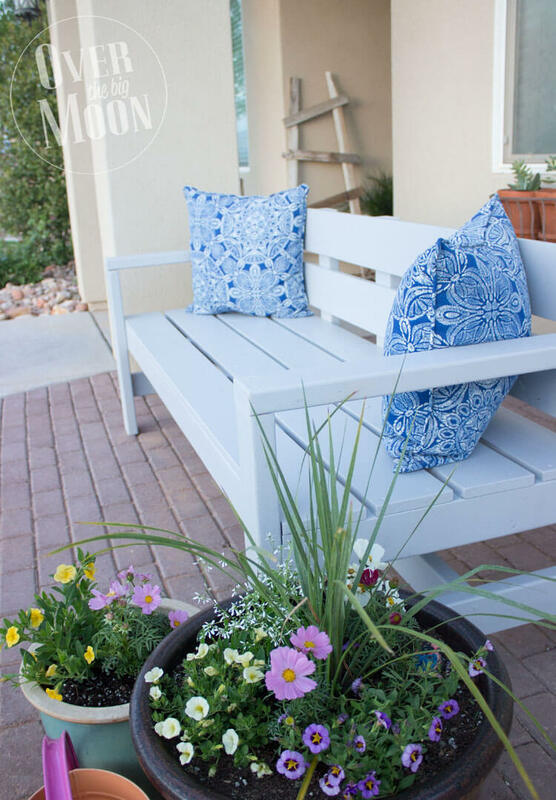 The pictured color choice obviously plays off the blue pillows, but consider the flowers and surrounding furniture on your patio as you select your paint. Who wants a hammock when you can have a whole bed? 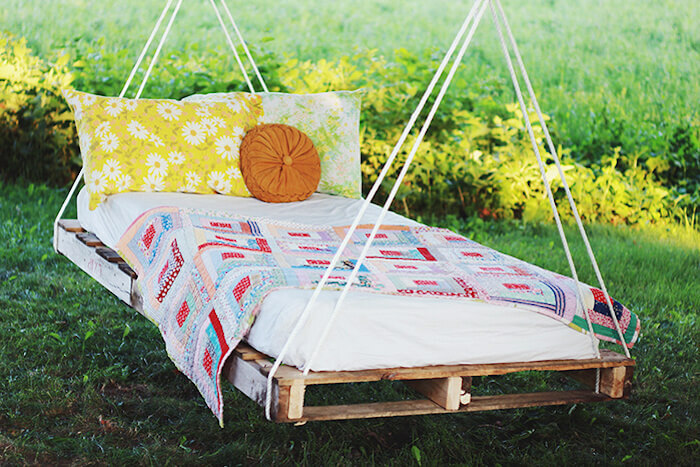 This creative bohemian idea has a sweet charm to it and can be created at home using a few trusty pallets, strong ropes, and a solid tree. Get some rest while enjoying the summer sun. Just be sure to put the mattress safely away before the fall rains begin. 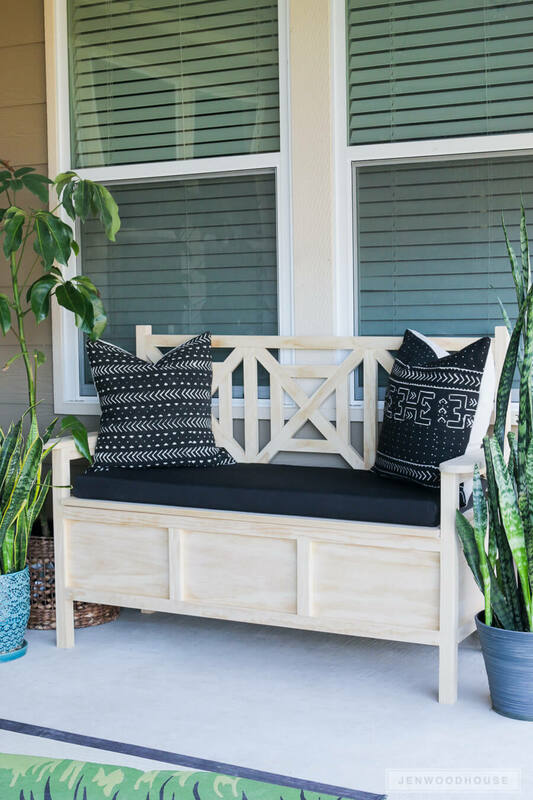 This piece of perfect DIY patio furniture is exactly right for those who want to create a high-end look at home. It is small details like the iron rods, crisscrossed legs, and deep dark stain that give this piece an expensive look. It is ideal for hosting all your outdoor summertime dinner parties.